Cadiele & Jeff were married on May 16th at the GORGEOUS Star Ranch in Corona, CA. Overlooking the entire Corona region, the venue was perched high on top of the local mountains and had a fabulous view of local mountains, greenery, a few horses, and the beautiful skies that surrounded it. When first arriving, you take the shuttle up the steep hill and arrive at Lefty’s Bar where the Groom (Jeff) was waiting to greet the guests-drinks were in hand, a relaxed groom smiled at everyone who entered. Attire included your cowboy boots, sundresses (it was 101 degrees when we arrived to deliver the cake! ), and denim. We arrived to the to reception cite to see an array of wooden tables lined with burlap and lace table runners, Mason jars ready to be filled with beverages, and beautiful paper flowers lined the sweetheart table and the bar adjacent to the dance floor; all DIY. Cadiele and I went to High School together, I was a few classes ahead of her. I first met Jeff at their cake tasting, he and Cadiele were just wonderful. Both smiled and were so excited to be planning their wedding. For their wedding, they chose to have Apple Bacon Harvest, ShamROCK & Roll, and our Salted Caramel Cupcakes. 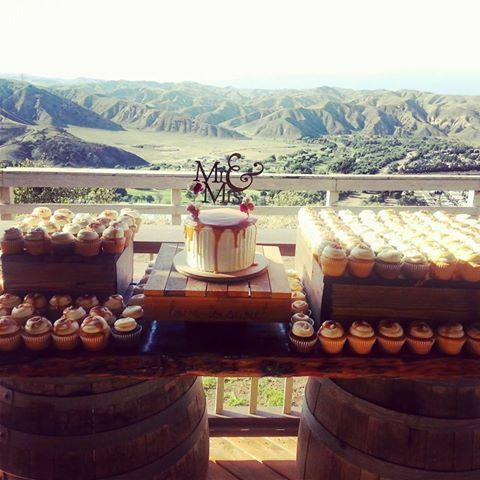 They mentioned their rustic theme, so we did wooden cake stands on top of their wine barrel table and set a dessert display. 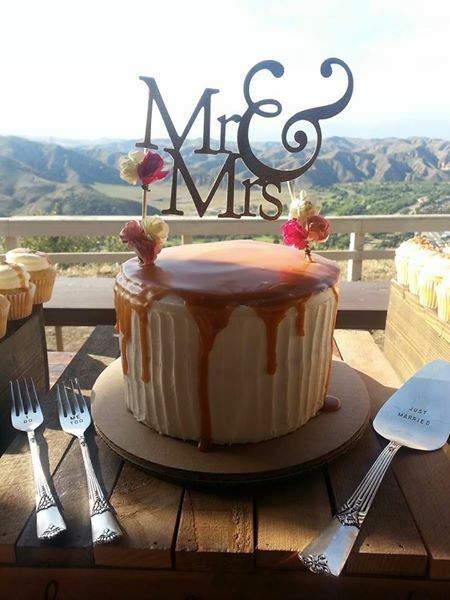 Their cake was a textured salted caramel cake, with caramel drizzle down on top, just gorgeous for their vision. They had a custom paper topper from Etsy, which matched perfectly and blew in the breeze so lightly. Their entire day was a vision from a magazine-rustic with pure elegance throughout. Congrats Mr. & now Mrs. Buffington, cheers to a lifetime of sweet memories and joyous occasions. Thank you for choosing [desi]gn cakes & cupcakes to celebrate your day.